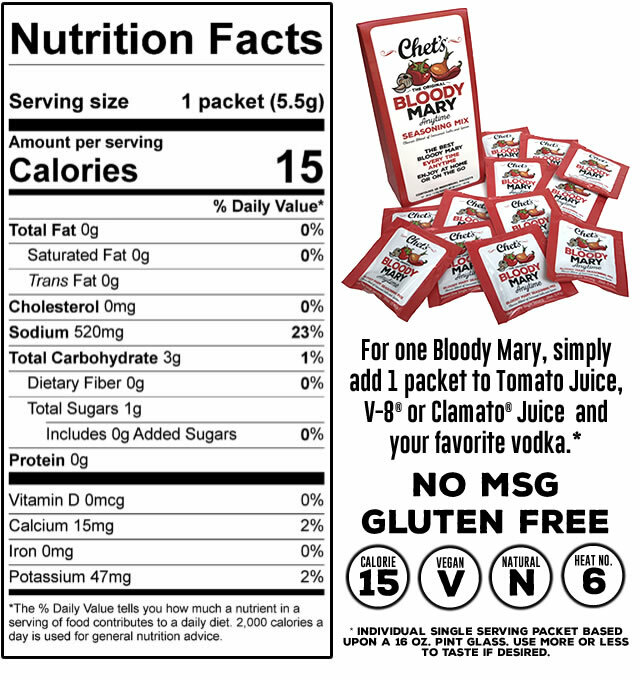 Chet’s Anytime Bloody Mary Mix Nutrition Facts: Each convenient single serving packet of Chet’s Anytime Bloody Mary Mix uses natural ingredients. Natural ingredients bring out the best tasting Bloody Mary as it is the perfect symphony of savory flavors. That is why we spent months perfecting just the right blend to bring out the robust, spicy taste you would expect in a Bloody Mary. Our seasoning mix contains; Celery Salt (Salt & Spice), Worcestershire Powder (Maltodextrin, Distilled Vinegar, Molasses, Corn Syrup, Salt, Caramel Color, Garlic Powder, Sugar, Spices, Tamarind, Natural Flavor), Garlic Powder, Paprika, Sumac (Salt), Black Pepper, Red Pepper Flakes, Cayenne Pepper, Horseradish Powder and Parsley Flakes. Chet’s Anytime Bloody Mary Mix Nutrition facts include just the right amounts of each spice is blended perfectly to bring out a Bloody Mary seasoning mix bursting with flavor. 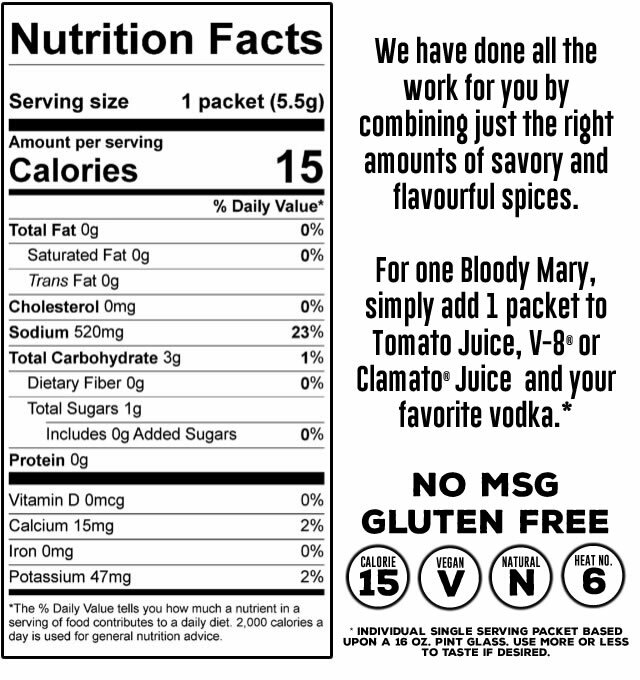 Now you can get all the ingredients it takes to make a great Bloody Mary in a quick, convenient individual serving packet. It does not get any better or easier than this!